Veterans Day is Sunday, Nov. 11, but is observed on Nov. 12, so many government organizations are closed and there won’t be any mail (see our list of What’s Open and What’s Closed on Veterans Day in Champaign-Urbana). While many kids will still go to school on (observed) Veterans Day that doesn’t mean they won’t be acknowledging this day at school. School districts often plan assemblies on Veterans Day (or another day during the prior week) to honor community members; these assemblies are typically open to the public, so just contact your local school if you would like to find out how they are honoring Veterans Day and if you can attend. There are some activities in the community on/around that day to honor local veterans (check our calendar), but it doesn’t have to be Veterans Day to show your children the impact of the military and veterans in our community. Here’s a list of places in the greater Champaign-Urbana area that provide opportunities for us to reflect on the sacrifices many have made so that we can maintain our freedom and liberty. Memorial Stadium, Champaign: Memorial Stadium was originally constructed as a memorial to Illinois alumni who died in World War I. In 2002, the university “extended” the stadium’s original dedication to honor all members of the Illinois family who served in the U.S. Armed Forces and, in particular, the 932 alumni, students, faculty and staff who were killed in U.S. wars and conflicts since 1918. Their names are engraved on four limestone tablets at the entrances to Memorial Stadium’s east and west colonnades. The Armory Building, University of Illinois: It’s not just for track and field. One of the oldest buildings on campus still in use, the Armory was built for military cadet training, a purpose it fulfills to this day. Museum of the Grand Prairie: Located in Mahomet, the Museum of the Grand Prairie has a particular focus on President Lincoln and his doings in Champaign County. There is also a lot of content about local people who served in the military. Douglas County Museum, Tuscola: This small museum that is mostly run by volunteers boasts of a military collection under its roof, including uniforms, weapons, war memorabilia and field radio equipment. It spans all of the major 20th century wars with a special emphasis on World War II. Savoy Veterans Memorial: This small memorial can be viewed off of Route 45. Bement Veterans Memorial Park: This is a fairly impressive memorial, especially for a town of 1,800 or so. Head to the center of this Piatt County town. Champaign County Memorial: In front of the Champaign County Courthouse in Urbana. 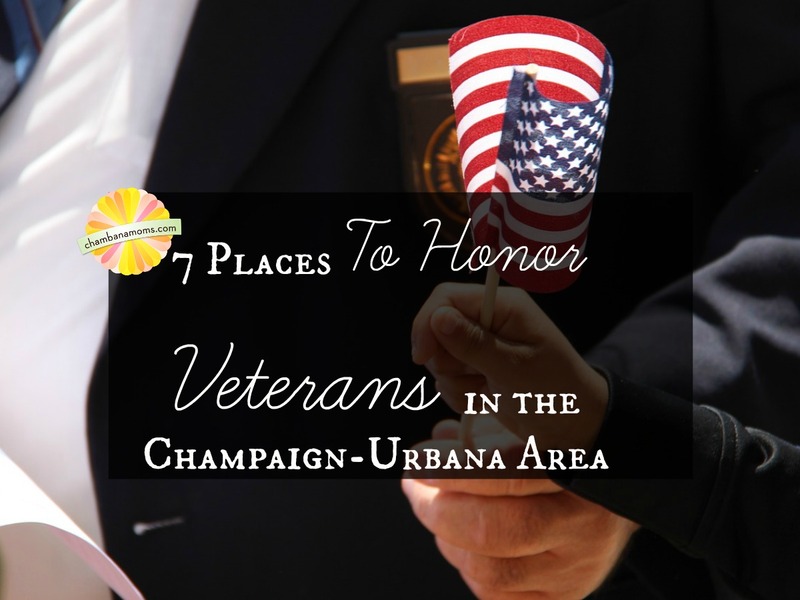 Do you know of a place to honor veterans in Champaign-Urbana area? Please list it in the comments below.